Alburgh, VT, May 18, 2011-- A stack of pennies collected by a fourth grade class at Alburgh Elementary School has risen close to Penniesfour hundred dollars to benefit the Vermont Haiti Project. 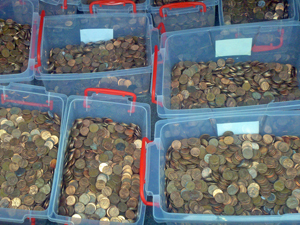 In the end, by using one full crate as a measuring tool, the class concluded that it would need 204-million pennies to fill the room. More importantly, the kids raised close to 40 thousand pennies. After bank service charges (converting the pennies to dollars), rouAlburgCheckghly 375 dollars will go to the Vermont Haiti Project. During a year that has already seen a tragic earthquake, nationwide floods, and political unrest, Haiti has now been plagued by an outbreak of cholera. The death toll has exceeded one thousand from this infection of the small intestine primarily caused by consuming contaminated drinking water or food. 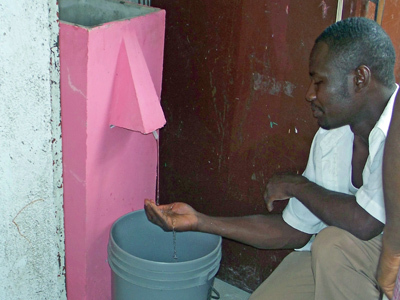 Thankfully, the use of bio-sand water filters, which Vermont Haiti Project has provided to communities at vManyFiltersirtually no cost, has resulted in zero incidents of cholera. We're feeling so happy to write on the name of our community because we want to say thank you to all members and friends of VHP for all great support. VHP has given us the opportunity and ability to treat and to have Clean Water to drink! We also want to say thank you to friends at Rotary South Burlington. Since Jan. 2009, we started to solve a lot problems of disease in our community with using Bio-sand filters for water to drink, to do everything, and to help tFiltero save the money that people used to buy water before. We also do a lot of education for the people. The Bio-sand filter is a big protection for us, it help us to prevent so many kind of microbes since 2009 to today. As now, our area and I, we have not yet been touch by the cholera. We're so happy and feel free to say that, grace of God and VHP, our community of Port-Au-Prince, Delmas 60 Musseau will be not be touched by the cholera. 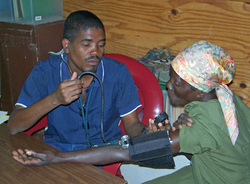 Despagne: Manager of the VHP program in Haiti. Thousands of homes and businesses were destroyed by the January 12, 2010 earthquake that centered near Port au Prince. 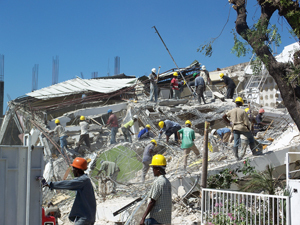 Additionally, many residents and store owners have refused to re-enter their dwellings, out of fear of instability, or a subsequent quake. 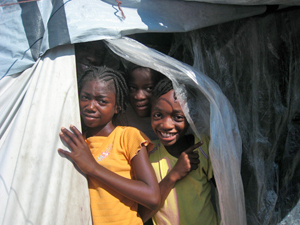 The result is that many Haitians now find themselves living and working in tents-- at least until they are assured a safe return into their dwelling. To assist, VHP has enlisted the generous support of Phillip Aaronson to help raise funds for the purpose of temporary shelter. Yesterday I was finally able to get some photos of the distribution of the tents, DSCF2450mosquito nets and tarps in Port-au-Prince. You will see that some of the tarps were used to set up makeshift classrooms for a school. 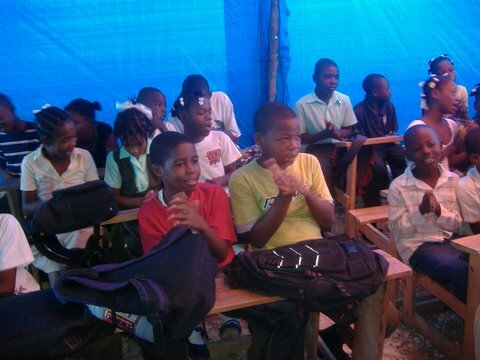 The tents were distributed to people in the neighborhood by the Maudé family that runs the school and cares for many children. I have met Maria and Ysmay and some of their extended family. They told me that the tents were received with much joy and excitement. It has been a privilege to be in a position toDSCF2470 lend a helping hand in a time of dire need. You all made it possible and on behalf of all the people who benefitted from your generosity, I send a heartfelt thank you, with special thanks to Kimball Butler and all the other dedicated volunteers at the Vermont Haiti Project, who asked me back in January if I could find tents, and without whom this would not have been possible. Members of the Vermont Haiti Project have been able to make three separate trips to the nation since the earthquake struck Haiti on January 12. We are just back from Haiti. It has been almost 3 months since the earthquake and my biggest impression is the uncertainty that the people are dealing with – how long will they be living in a tent? Will they be able to repair or rebuild their house? Should they move out of the city? When will their children go back to school? Where? Is it safe? So many problems, multiplying the difficult life they already had. In some places life appears as usual with street vendors and traffic congestion. Then, try to drive to a business to find it was destroyed. One can only imagine the loss and grief and memories of the terrifying events. So many sick and injured people remain in hospitals or need follow up care. Hundreds of people line up every morning at medical clinics, some get in, some try again tomorrow. When we were working at the Community Hospital clinic there were nurses, but not enough doctors. Were legs healed enough to bear weight? Was it time to remove a brace? Difficult to know for sure without an orthopedic specialist. We saw buildings caved in or flattened and people living in refugee camps all over Port au Prince and outside of the city. There are piles of rubble everywhere, some people scooping up crumbled cement into a dump truck, one shovelful at a time. The further from the airport you travel, and down side streets, the worse the conditions of these camps. Near the airport, the tents are made of shrink wrap over a dome of PVC pipes; they have water tanks, latrines and medical stations. Away from there, the shelters are made of cardboard, wood boards, sheet metal, tattered sheets and tarps over sticks; there is not enough water, food, medical attention, no latrine. We saw infected wounds and dehydrated babies, and a birth – woman in labor in a dirty tent with flies all over her, gave birth to a healthy appearing baby girl. 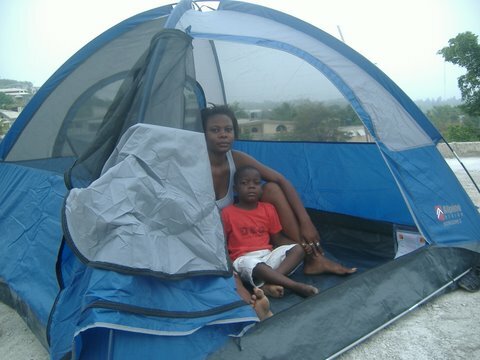 The mom was given a clean tent and supplies the next day. Maria, the school director, slept outside in the open with her small children for four days before they got a tarp. She is separated from her children now so they can be safe in the Dominican Republic with a relative, and Maria plans to reopen the Foyer d’Espoir school April 12, under a tent. Blackboard writing inside the school is still there “January 12, 2010” and Christmas decorations are still on the walls. With all of this there is courage, spirit and dignity. We will stand with the Haitians and never turn away. Ride for Haiti is one man’s grassroots campaign to raise awareness of, and support for, emergency relief efforts and ongoing missions in the nation of Haiti. I am pleased to share that Fletcher Allen is sponsoring a fundraiser at The Higher Ground Ballroom in support of the Vermont Haiti Project, a volunteer organization that runs a number of projects and partnerships in support of Haiti. The event will be held on Thursday, March 11, from 6:30-10:30 p.m. Doors open at six, and there is a recommended donation of $5 at the door. Rock’d Country, featuring vocalist McKenna Lee, Human Resources; Charlie Jones, PRISM; Jeff Allen, Supply Chain; Heidi Bean, R.N. ; and Monique Citro, O.R. The event will also include testimonials from staff who have returned from relief work in Haiti, and raffles that will also support the Vermont Haiti Project. We hope that you will join us for this event. For further information, please contact Whitney Taylor, 7-8645. In the wake of the earthquake that struck Haiti last month, Vermonters- young and old- have been showing their care for, and generosity to those effected. And by young we mean, specifically, Bonnie, 7, of Brandon. 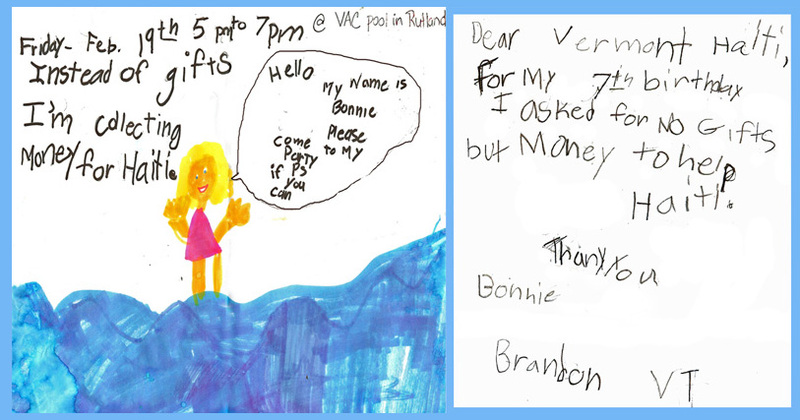 As the invitation and accompanying note (above) suggest, Bonnie chose to bypass presents and instead, used her birthday party as a fund raising event for Vermont Haiti Project. $140 was collected to go along with a spirit that should make all Vermonters proud. 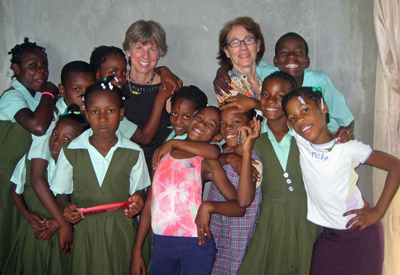 Kimball and Donna Thomas left February 8, with a plan to connect with the Haitian contingent of the Vermont Haiti Project and formulate their plans for the near future. During the next week they will assess the status of the school in Port au Prince that luckily, is still standing, but will need repairs. They will communicate with the teachers and hope to get the school open as soon as they can. The computers that were gathered in VT and shipped last May seem to be in working order. The whole neighborhood will benefit with a way to communicate out if the computers can get up and running. There is much to do! And that brings us to VHP's exciting vision of a coordinated effort to create a Living and Learning Center on a piece of land that the Vermont Haiti project already has access to just outside of Port au Prince. Many different areas of focus could come together into this one Center. A school, a vocational training center including training in alternative energy sources and sustainable building technologies; a farming project; the Biosand water filter production; and a living space for visiting groups could all be housed on this site. The center would also be the site of health education, check-ups and medical supply distribution. A women's sewing cooperative that recently started up making bags out of recycled fabric and plastic to raise much needed funds could use the space as well. This is all still evolving but with the connecting of resources, ideas and people, we can make it happen! 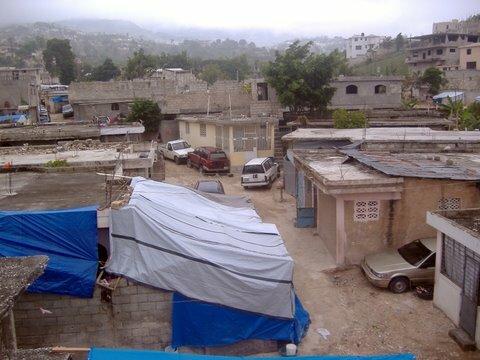 We will post another update about about progress in Haiti upon Kimball and Donna's return. 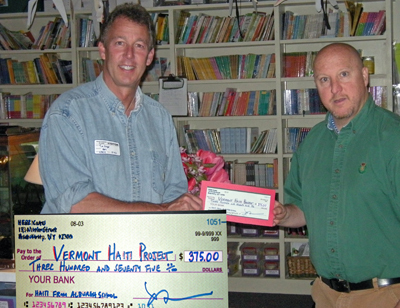 Here in VT there have been several local fundraisers for the Vermont Haiti Project including the Pennies for Port au Prince coin drive at Richmond Elementary school . Over $4,000 dollars were raised! Amazing! Check the list of upcoming VHP fundraising events. Come on out and bring a friend! A BIG thank you to all! January 19 (Kimball)- “I'll be there tonight if we get the truck fixed. It needs a fuel filter. We are at the national laboratory, at the tent hospital-- just watched the amputation of a leg in tent on a crate with Ketamine. 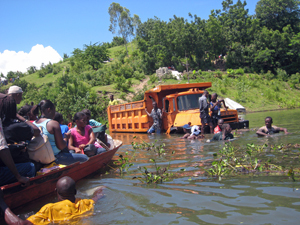 “(VHP Haitian partner) Despagne is on his way to Duchity to bury the dead son of his cousin. January 20 (Posted by Kimball’s sister, Laurel)- I was able to get thru to Kimball around 2pm today -- she, Elizabeth and Jason are fine - they went into Port au Prince today -- with a caravan of other cars -- all are OK - they were at a Belgium military setup while they were waiting to connect with Poulin (one of our Haiti family members - Despagne's- wife), then they are heading to Fon Parisean to work at a clinic/mission. They will connect w/ Stephanie, and Maria and her children who have arrived there . So far they are safe, and helping others!!! January 21 (Donna)- Jason, Kimball, and Elizabeth drove a truck back and forth to a hospital on Delmas 33 transporting patients. They were able to get some morphine to bring back to a Haitian christian mission in Fon Parisian. Maria and her children are headed to the DR today. Stephanie is staying w...ith Kimball helping to translate. Despagne, Polene and family will come to Fon Parisian today and try to make a plan for the immediate future. Here at Fletcher Allen we have organized a group of doctors, nurses, E.M.T. 's, paramedics, etc., who have signed up to do earthquake relief work. Right now 70 people; the plan here waFletcherAllens to send a team out every two weeks. We also have access to medical supplies. There are trauma surgeons who are available right now... there is a group going with the Red Cross on Wednesday. I understand that the Dominican is starting to get overwhelmed... a few have left already to the Dominican with plans to work just over the border. I am putting this out to those of you I know who are connected to relief work with the hopes of connecting some dots. For now, I think we are looking to find a staging area or work area in the Dominican. We need to find a place to be of benefit in either Haiti or the Dominican. 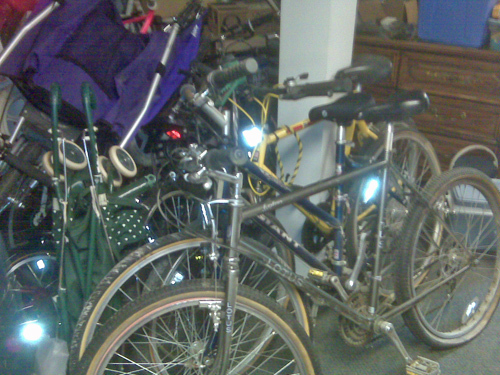 We have means of transportation of personnel and supplies and are looking for a way to get to Haiti via the D.R. We are also looking to find a place to work in Haiti. I know we all have connections and am hoping we can be instruments in getting these medical people where they are needed. Vermont Haiti Project continues to look forward in spite of the devastating earthquake. 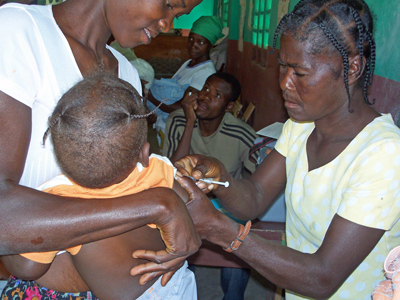 We have made a commitment to the communities we serve in Port au Prince and in the mountain village of Desab. We will maintain our assistance in providing bio-sand water filters, supporting the rural clinic and the rebuilding of the school. VHP stresses the importance at this time of doing what we are familiar with, that each organization or group has its own niche to fill. Haiti will be rebuilt as it has always been; rock by rock, block by block, neighborhood by neighborhood, and community by community. We are urging people to support grass root organizations with a standing history of working with the people of Haiti. We are encouraging the exchange of resources and knowledge amongst the many organizations helping out in this difficult time of great need. What Beckweth did was conceive a ambitious grassroots donation program. 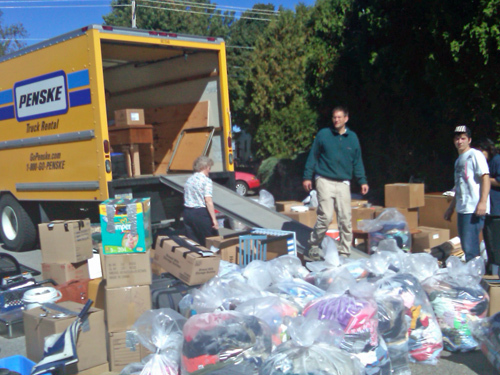 Labeled the “Spring Cleanup”, Beckweth and other VHP members and friends were able to solicit enough goods to literally fill up a warehouse. 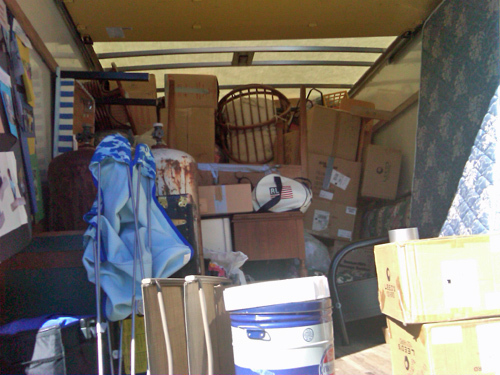 The group received space in an empty office in Richmond, Vermont, and went about collecting: Furniture; clothing; shoes; electronics; sporting goods and an assortment of other items no longer wanted in Vermont, but of great value to the people of Haiti. 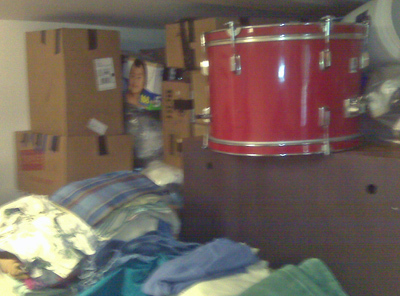 The collection drive lasted throughout the spring and summer and, in late September, a rented truck was loaded up and driven by LoadingAmy and Kimball to Miami. Phase two of the operation will see the goods shipped by boat to Port au Prince, where it will be met by members of VHP and volunteers. While the program has been deemed a huge success, it hasn’t been without it’s cost. “People were great in terms of donating things,” said Donna Thomas of VHP, “but we had to pay for the truck rental and transportation. We are still a few thousand dollars short. To help out, and read more about the Spring Cleanup, please go to this link. 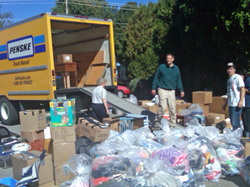 While the truck is loaded and the goods are on their way, donations continue to be accepted. If you, or someone you know is interested in a financial or material donation, please CONTACT US. Check out a video of VHP's "Spring Clean"
What most of the world takes for granted, most of Haiti’s citizens still consider a luxury. The access to clean water, and a system to deliver it is still severely lacking in the island nation. rotary As has been previously reported on this web site, the Vermont Haiti Project is actively involved with a program to purchase water filtration systems for local installation and usage. The response from the Rotarians was positive with the promise for some intial support, with the possibility of finding new ways to help the clean water mission. For further information or if you, or someone you know is interested in donating or helping out the clean water program, please CONTACT US. 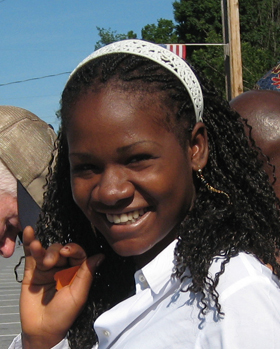 Stephanie, an 18-year old student from Port au Prince, spent her second consecutive summer living and studying at St. Michaels College in Colchester, VT. Stephanie is the daughter of Despagne Felix, one of Vermont Haiti Project’s native team members. Her tuition, and a portion of her expenses were paid for by the Vermont Haiti Project, most notably, team members Donna Thomas and Kimball Butler. 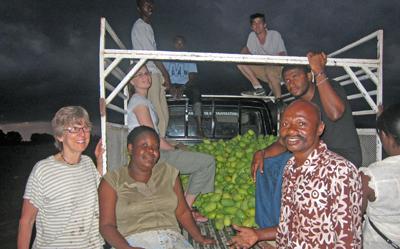 The Vermont Haiti Project looks at this experience as mutually beneficial. For starters, Stephanie has the opportunity to further her education and gain a valuable experience. At the same time, VHP will have- in Staphanie- a valuable friend, assistant and language translator while dealing with business in Haiti. Aside from study, Stephanie has had the chance to make new friends, attend parties and functions, and experience summer in New England. The St. Michaels program caters to foreign students seeking to improve their English, while experiencing the American culture. 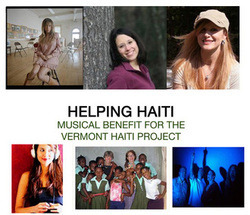 Get ready for Vermont Haiti Project, Inc.! 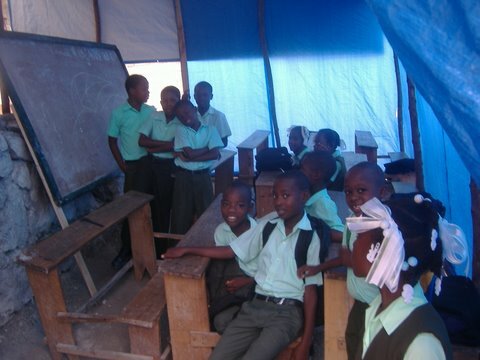 Since its inception in 2007, the Vermont Haiti Project has been working with theGroupShot help of the Vermont Institute on the Carribean. Thanks to VIC, generous donors have been given tax deductable receipts. When the paperwork is finalized, information regarding any changes to donation and operating procedure will be posted. Until then, all donations are still being accepted and are, of course, greatly appreciated. For further information or if you, or someone you know is interested in donating or helping out, please CONTACT US. 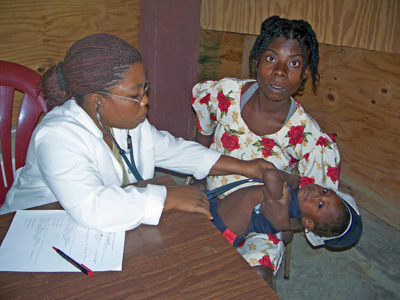 Thanks to financial backing from The Keane Foundation and other generous donors, Vermont Haiti Project has succeeded in establishing a regularly operating medical clinic in the remote village of Desab. 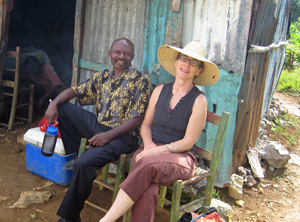 Working in partnership with Fenel Jean and Eunice Tassone of HASWEP, the clinic began operations in November, serving Desab and the neighboring villages. The clinic operates twice weekly, headed by Dr. Dorcelus, a physician who grew up in the region and currently practices medicine in the nearby town of Cabaret. Also on staff are a nurse, two health care assistants and a lab technician, with plans to add a part-time dentist. 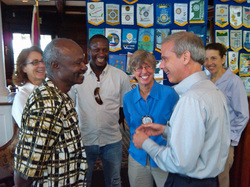 The Vermont Haiti Project will continue to support this effort in hopes of building a sustainable operation. If you, or someone you know is interested in donating or helping out, please CONTACT US. Young Desab citizens help carry clean water to the medical clinic. Four Vermont Haiti Project members- Kimball, Donna, Alex and Daniel- spent two weeks in Haiti. Their primary purpose was to take part, as well as supervise in the training of building bio-sand water filters. Donna writes: “The 4 Haitian men who came to the training with us had their neighbors over and taught them about clean water. They were most engaging and after the first day had orders for 25 filters. The cost to us is 30 US dollars. The cost to a family is 5 US dollars. The difference will come from our pockets and from you. When a Haitian works, and work is scarce, he/she may make 8 dollars a day. Not enough for lunch in the US. The costs for food here are high. How anyone survives is beyond me. Vermont Haiti Project co-coordinator Kimball Butler visited Haiti shortly after two hurricanes caused severe damage to the island nation. Kimball was in Haiti to follow-up on some of Vermont Haiti Projects ongoing programs, as well as explore a new agricultural venture in a remote mountain village. However, there was no escaping the effect that the storms had on the island. 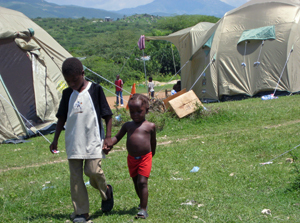 Below left: Two children walk amidst a makeshift tent village, as many homes were destroyed from the flooding. Center: Rivers rendered many roads impassable by any vehicle other than boats. Right: Kimball and Despagne relax following a nine hour bus/boat/motorcycle trip into the mountains.